Northern Oklahoma College held an on-site enrollment at the Kaw Nation Education Center. 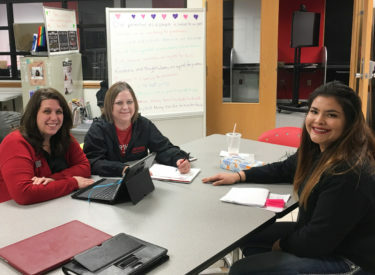 Pictured from left are Anna Scott, Distance Learning Specialist; Gina Conneywerdy, Native American Recruiter and Adviser; and NOC student Storm Jones. Northern Oklahoma College conducted an on-site enrollment event at the Kaw Nation education center recently. NOC students dropped by and enrolled for the 2019 spring and summer semesters. Gina Conneywerdy, NOC’s Native American Recruiter and Adviser, met with Kaw Nation tribal members to provided assistance with financial aid, tribal funding, bursar questions, and course enrollment. NOC worked with the Tribe to create an educational access site in the Johnnie Ray McCauley Multipurpose Center, where students can use NOC computers to take online classes or connect to ITV courses. NOC is currently enrolling for the 2019 summer semester and fall enrollment will begin after spring break. Four sessions of summer school run from May 18 to Aug. 1. Fall classes are projected to begin Aug. 19.